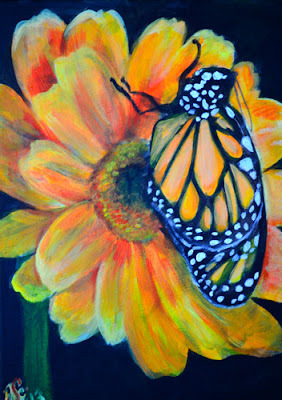 I had previously mentioned on my Facebook page and in a former post I had begun scheduling to teach... some casual classes at a paint 'n' sip studio in NW OKC called Therapy. 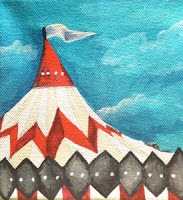 The two Circus Tent pieces below are Big Top and Lil' Top. These are small acrylics I made in 2011. I love the whimsy, history, and somewhat clandestine mystique of the circus and am happy to know of a few that are do not employ the use of exotic animals. Lil Top is my favorite of the two because it reminds me of a lot of the fairy-tale-type canopies you see on Pinterest in the homes with mega-bohemian interiors, but kind of out in the woods. 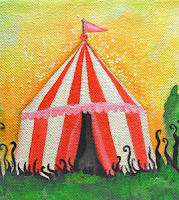 These tents are offered up as sessions for April 11th and 18th and listed as appropriate for "Mommy and Me" -bring one of your younger artists in your family to make a circus tent with you. I hope these classes go well. I have one more day of PEEPS volunteering to do the day before one of them so i will be warmed up.